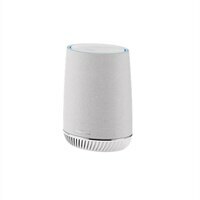 Orbi Voice is a smart speaker that extends your existing WiFi to any room. It has Amazon Alexa built right in so you can voice control your music and other smart home devices. High-performance tri-band Mesh WiFi extends your existing WiFi by up to 2,000 square feet, so you have better WiFi in more places. Play music from Spotify, Amazon Music, Pandora, iHeartRadio, TuneIn and more - all you have to do is ask. Built-in 4-microphone array and far-field voice recognition enables Orbi Voice to hear you from across the room. Audio by Harman Kardon creates exceptionally rich, room-filling sound for a captivating listening experience. Use the Orbi app to easily adjust the bass, treble, and more.